Del Mar, CA (July 28, 2018)-Fly to Mars began his career with a win in a $50,000 claiming race for maidens, finishing fourth in June 2016. 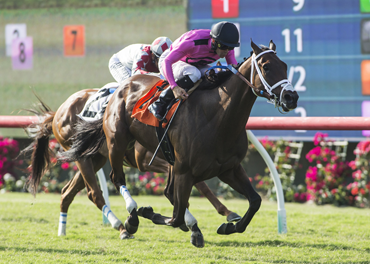 Saturday at Del Mar, a dozen races later, Fly to Mars won his first stakes in the $151,725 California Dreamin’ Stakes for California-breds at 1 1/16 miles on turf. Fly to Mars was timed in 1:39.50, a course record. The final time was 2/100ths of a second quicker than Sidney’s Candy’s clocking in the Grade 3 La Jolla Handicap in 2010. “To break the track record here is something,” trainer Peter Miller said. Fly to Mars ($11.20) had a perfect trip under jockey Flavien Prat. Fly to Mars was second for the first six furlongs, tracking pacesetter Pee Wee Reese, who set early fractions of 22.86 seconds for the opening quarter-mile and 46.12 for a half-mile. Fly to Mars took the lead in early stretch and won by a length over 11-1 Grecian Fire. B Squared (8-1) finished third. Camino Del Paraiso finished fourth, followed by What a View, Ashleyluvssugar, Pee Wee Reese, Well Developed, Accountability, Ward ‘n Jerry, and Alsatian. What a View, Ashleyluvssugar, and Pee Wee Reese are graded stakes winners. Fly to Mars, a 4-year-old gelding by Ministers Wild Cat, is owned by breeder Gary Barber. Fly to Mars won an allowance race with a $62,500 claiming option at a mile on turf at Santa Anita on June 10 in a prep for the California Dreamin’. “I thought we could win the race,” Miller said. Fly to Mars has won 5 of 14 starts and earned $263,358. Earlier this year, Fly to Mars was second in the Clocker’s Corner Stakes on the hillside turf course at Santa Anita.